Max is obsessed with dinosaurs. He knows his Tapejara from his Pteranodon and can find fossils better than a trained paleontologist. When he discovers a stone tablet that transports him to the age of dinosaurs, it's a dream come true--until it becomes a nightmare. An evil genius named Dr. Z has enslaved the dinosaurs so he can use their hidden powers to take over the world! Now Max has to defeat Dr. Z and his Alpha Gang to save the ancient beasts and life as we know it. 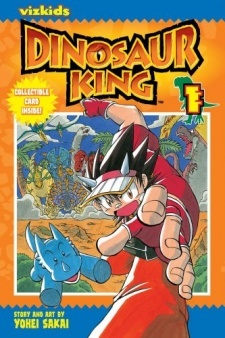 Dinosaur King was published in English by VIZ Media under the VIZ Kids imprint from February 2, 2010 to April 6, 2010.